Temec is a proud supporter of March of Dimes Canada. 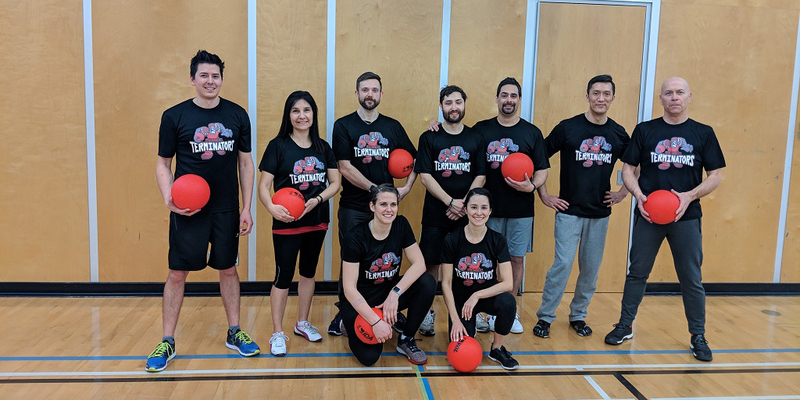 Temec has participated in the annual Dodging for Dimes charity dodgeball tournament at the Creekside Community Centre since its inception. The D4D tournament is a fun afternoon for a great cause: we encourage anyone reading this to consider participating. For the 2018 tournament, mistakenly thinking a name change and some cool shirts would guarantee triumphant victory, the Temec Torpedoes dodgeball team rebranded as the Temec Terminators. But why stop at just one triumphant victory? So we fielded two teams (T1 and T2, obviously), hoping for gold and silver at the podium. Of course, this did not end well: the Terminators finished last and second last. In fact, the only Terminators “win” was when the two Temec teams played each other! Overall, 2018 was not a good year for the Terminators. But, just like Arnold, we’re back. Back to basics, as well: one team (left to right, upper) Joe [Low] Blow, Bionic Bobbi (C), The Tom-inator, Juan [Last Request], Pierre the Pulverizer, Ron Rampage, Mark [Of The Beast]; (lower) Keira Spike-ly, Cathe Catastrophe. The new team seems to be working: we’re happy to report that the Terminators took the silver medal at this year’s tournament on February 23, 2019, but we’re really happy to report that Temec was the top fundraiser, and was also voted the best dressed team! Thanks to all the Terminators, the other teams and the winning team from Blake, Cassels & Graydon LLP (who looked like they might do this more than once a year). Temec would also like to thank all the players, officials and certified dodgeaholics from the Vancouver Dodgeball League; the Creekside Community Centre and its staff; March of Dimes Canada; Len Baker (thanks for the shout out on TV, Len), Mary-Lynne Stewart and Angela Wright, and Global BC. The Terminators had a great time and we are all looking forward to being back – again – in 2020! Consider it Judgement Day, Blakes!